Automatic three and four-part composition (styles: J.S. Bach, Max Reger, Jazz, Pop plus creating your own styles), automatic harmonizing, automatic fugue and canon composition. Carry out the Man-Machine test! 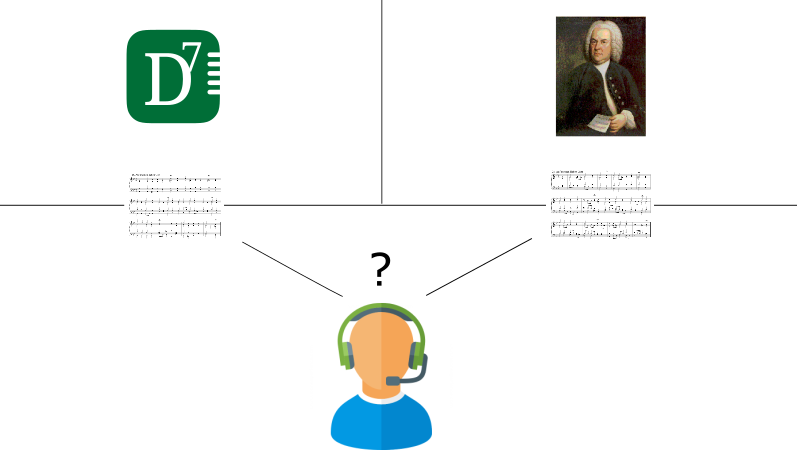 Test if tonica is able to simulate the great composer Johann Sebastian Bach. Do you recognize the original composition? Find the evaluation of test results here. You know what it's like: Only an hour to go until choir practice and you had intended to compose a four-part harmony for your choir to sing... You have to do composition homework or a tricky analysis? tonica does this work for you in a matter of seconds! tonica composes four-part harmonies, canons, preludes, partita, fugues, Jazz standards and realizes figured bass. While other programs try to delude users into thinking they are gifted composers with a primitive automatic accompaniment, tonica uses a totally different approach: Based on neural networks, tonica is actually able to compose in the style of the old masters. tonica will solve the same task in different ways. You will be surprised! You compose the melody of a song, hymn, piece of music, canon or fugue. tonica fugata does the rest. A Jazz-standard in no time! You enter the melody and let tonica fugata create the Jazz harmonies. It's as easy as this! tonica fugata comes with rythmic accompanying patterns in several pop music styles. Together with pop or Jazz harmonies you won't get a "strict" composition but a cool and easy song (tonica fugata contains all functions of tonica pop). Evaluating your own compositions is easy: The program has been designed to tell you whether you have added the right notes to the chord in the four-parts, whether you have put the accidentals in the right places and whether you have made forbidden consecutives or other mistakes while composing your chords. If you want to evaluate one of your practice harmonies, all you have to do is create two windows, one containing your work and the other with the file created by tonica fugata - it couldn't be easier! Forbidden parallels are automatically displayed in the notation. Chord analysis is carried out in the evaluation window. Just imagine, you are faced with a complicated analysis of a piece of musical notation, and you are unsure as to whether a chord is a shortened dominant sept-nonchord or just an extended sub-dominant triad. tonica fugata will take care of all your doubts at the click of a mouse. tonica fugata is also able to analyse exactly complete notations, which contain no function or level indicators, based on a tonal centre. So if you ever wanted to know just what you or others have created, before you proudly present it to an unsuspecting public, or if you ever wanted to sneak a look at the masters, then tonica fugata's analysis function is the ideal tool for you.